Gwalior fort is located on a hill in th Gwalior city of Madhya Pradesh. The hill known as Gopachal and the fort is also known as Gwalior ka kila. It is one of the most visited place in Gwalior. The fort was built in 8th century. The trip of Gwalior is considered incomplete without the trip of Gwalior fort. 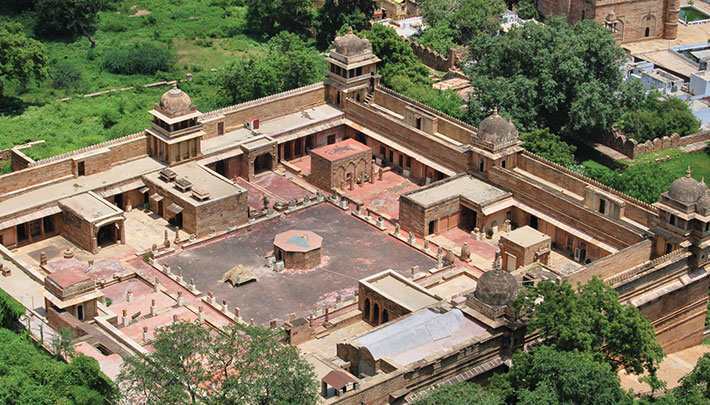 The fort is located near the Gwalior Railway station and Phoolbagh. You can reach the fort by foot or by vehicles. As the fort is located on the hill the walking route is quite steep. The Gwalior fort has a magnificent history, which started from 8th century. The fort saw many Rulers such as Pal dynasty, Gurjara-Pratihara Dynasty, Turkic conquest, Tomar rulers, Suri dynasty and Hemu, Mughal dynasty, Raizada dynasty, Maratha rule, etc. It also saw the rebellion of 1857. 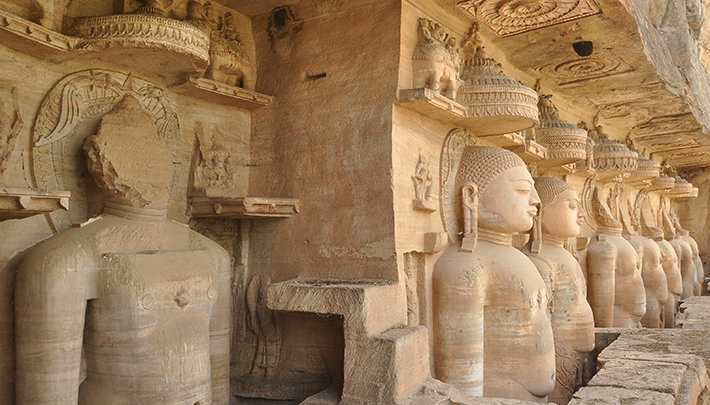 In 1527 Babar attacked the Gwalior Kila and damaged the some Jain idol statues. The fort is in fair condition and it consists many temples and historic monuments. The main temples are inside the fort complex are Jain temple, Urvahi Temple, Gopachal Temple, Saas-Bahu Temple, Teli ka Mandir, etc. It houses some of the palaces and historic monuments like Hathi Pol, Garuda monument, Karn Mahal, Vikram Mahal, Chhatri of Bhim Singh Rana, etc. Gujari Mahal museum is also located inside the museum. There are 11 Jain temples inside the fort complex which were made between 7th to 15th century. There are 1500 idols in Gopachal temple and all the idols were carved from rocks. Hathi pol is the name of a giant gate. Garuda Monument is the highest in the fort complex and dedicated to lord Vishnu. The Saas Bahu temple is also dedicated to lord Vishu and it is the combination of one small temple and large temple. Vikram Mahal is a temple dedicated to lord Shiva and it was built by Vikramaditya Singh. Gwalior fort also houses the reputed Scindia school and Sikh Gurdwara Data Bandi in the premises. Light and Sound show can also be enjoyed at the fort. Gwalior is one of the main city of Madhya Pradesh state of India and distance from Delhi to Gwalior is about 300 KM. Gwalior city has a Airport and Railway station. Gwalior airport has limited number of flights and Gwalior station has plenty of trains from all parts of India. The fort is located just 3 KM away from Railway station and 12 KM away from airport. 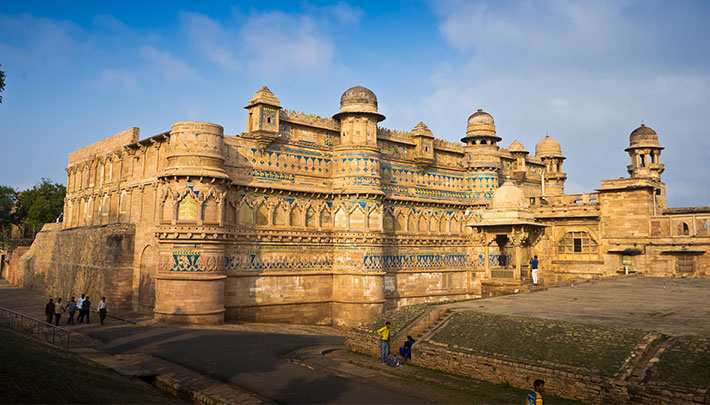 Gwalior fort can be reached via shared autos, private autos, cab and taxi. The public transport facility in Gwalior is good. The fort opens from 8 AM to 6 PM every day, however, some of the monuments inside the fort can be visited between 9.30 AM to 5.30 PM. You should spare at least half a day to visit the entire fort. The entry fee for Indian nationals are 5 Rs and for foreigner have to pay 100 Rs. Camera charges are 25 Rs. Light and sound show charges are 75 Rs. Best time to visit Gwalior fort is September to April. Summers are very hot in Gwalior and temperature can go up to 45C, so summer season should be avoided. After the visit of Gwalior fort visitors should take a trip of Tigra dam and Gwalior zoo.